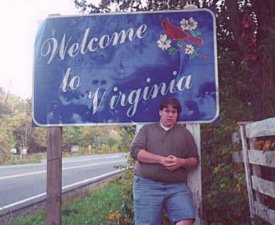 Maybe I should have posed in front of Virginia's other welcome sign. The one that says, "RADAR DETECTORS ILLEGAL." The Commonwealth of Virginia is one of the states that uses essentially the same welcome sign everywhere. This sign is virtually identical to the one on I-66 just across from Washington, D.C. It's simple, nice-looking with the cardinal and the dogwood (Virginia's state bird and flower). 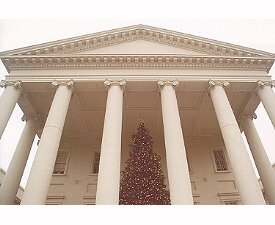 "Welcome to Virginia" is written in cursive, and the white on blue matches the state flag. Don't know how old this sign is, though it does show some wear and it also needn't be concerned with updating the Governor's name every few years. How I chose this particular sign was similar to how I chose New York's: I was driving around looking for the welcome sign of a border state and figured that this was as good a time as any to get this one. As you either will read or have already read on the West Virginia page, I found a good one on I-81 but it was just beyond the Potomac River bridge and either on a gantry or in the median and therefore inaccessible. And since Virginia has pretty much one standard welcome sign, I figured this one was as good as any. 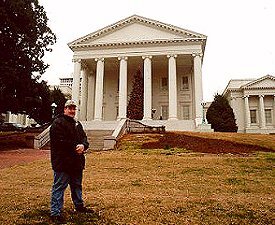 Virginia is the closest state to me where I say to myself, "Self, I'm starting to get really far away from home [New York/New Jersey area]." It's funny, reading American History textbooks and seeing how important Virginia was back then. Now, it's almost like, "Virginia who?" Virginia is named for Virginia Dare, who in 1588 became the first English child to be born in the New World. Prior to 1863, West Virginia was part of Virginia. Normally a prospective new state needs permission from the state legislature in order to break off and become a separate state. But since Virginia decided to be silly and do that whole Civil War thing, Congress just winked and said, "Virginia's busy right now. Go ahead and form West Virginia. They won't mind." 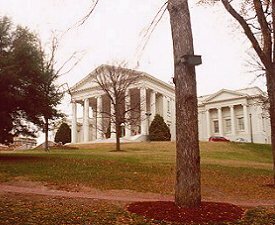 Virginia has one of what I refer to as those "non-traditional" state capitols. 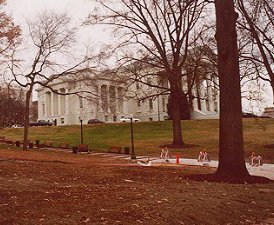 It is reminiscent of the United States Supreme Court, the Lee Mansion in Arlington National Cemetery, and even the White House to an extent. 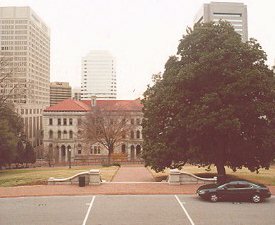 The capitol grounds occupy a city block on the cusp of a steep hill on the east side of Richmond, bounded on the left by 9th Street between Broad and Bank Streets. The immediate area of the grounds are bounded on the right by Governor Street (about even with 12th Street, which ends at Bank Street), though the entire complex is much larger, extending all the way to just past Interstate 95 by 15th Street. The portico in the picture juts out from the rest of the building. It really stands out well from the top of the hill that overlooks the United States Court of Appeals across the street. Just estimating, I would say that the steps of the capitol are probably about 30 feet above street level on this side. Directly behind the building, the incline levels off. 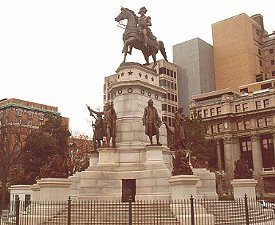 There is a very impressive statue of famous Virginians, similar to a corresponding monument on the Capitol grounds in Columbus, but even more grand. 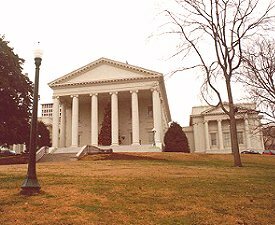 It is topped by an equestrian statue of Virginia's most famous son, George Washington. The horse is depicted with one hoof raised. Actually, the story about how the number of raised hooves in an equestrian statue represents how the subject died is not true. About half the time, including here, it's not accurate. Despite one raised hoof, Washington did not die from wounds received in battle. 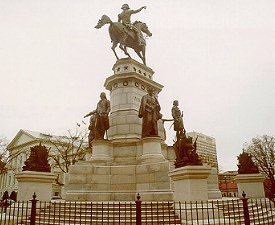 The monument is beset by about eight stone steps all around, which is unnecessary since the entire statue is fenced off. There is also a Zero Milestone. I saw a Zero Milestone listed in Washington D.C. just south of the White House in my Rand McNally but I never knew what it meant. 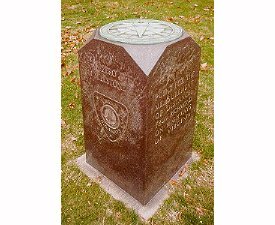 It is a monument, about eighteen inches square and three and half feet high and a sculpted compass on top. On its side it says, "Point for the measurement of distances from Richmond on highways of Virginia." 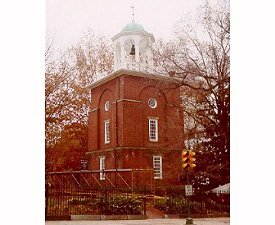 So when you see a sign that says "Richmond, 15 miles," now you know it's 15 miles to this point even though you'd enter the city limits a few miles sooner. This page loaded in 2.613 milliseconds.